One of the greatest corrections ever will be published in The Wall Street Journal on March 29, 2018 – sort of Erev Pesach. It is in regard to a story published on page A3 on Wednesday, March 28, 2018, titled ADELSON AIDED ISRAELI FIRM BEFORE ITS E.P.A. DEAL, by Timothy Puko. 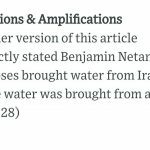 The Wall Street Journal had to issue a CORRECTION that PM Netanyahu said that Moses brought water from A ROCK, not IRAQ. Of course, more importantly, the story is states that Sheldon Adelson allegedly used his influence as a Republican donor to help Water-Gen Ltd. and its USA division president, Yehuda Kaploun, get into the Environmental Protection Agency to pitch its GEN-350 atmospheric water generation technology to EPA chief Scott Pruitt. Water-Gen board member, professor Alan Dershowitz did not attend. ← Previous Story Will Zucktown Need a Rabbi and Shul? B’nai Ner Arava?